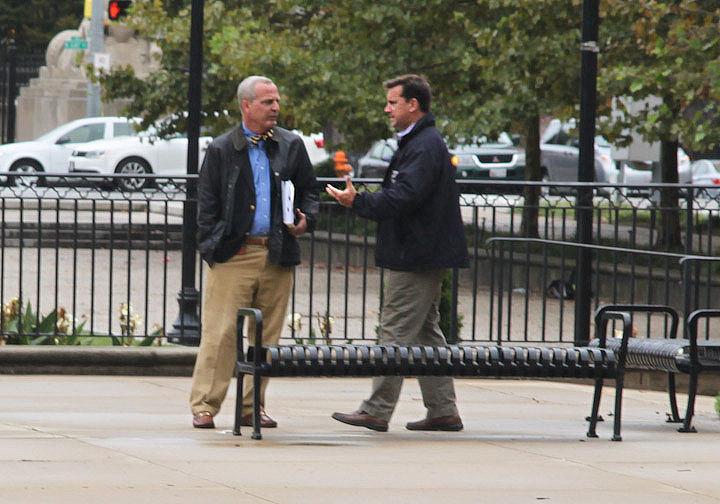 Above: Crossbar consultant Peter Auchincloss and co-owner Brian McComas in front of City Hall after today’s ruling. Reversing a decision he called “incorrect and inexplicable” by the previous Liquor Board, chairman Thomas Ward, joined by fellow commissioner Dana Petersen Moore, today declared the liquor license for Crossbar dead. At issue was whether a license at 12-18 East Cross Street in Federal Hill – unused since 2009 – was still valid. Licenses that sit idle for more than 180 days are invalid, according to state law. Under previous Liquor Board Chairman Stephan W. Fogleman, the board had declared the license for the controversial biergarten “viable,” citing the fact that the agency had repeatedly accepted payment from the licensees to renew it. That February 20 decision “made no sense” and was made “without fact-finding and with total lack of regard to its binding laws,” Ward said, slamming a ruling that was also approved by commissioners Harvey E. Jones and Elizabeth C. Smith. Asked if his clients, who have undertaken major renovations on the Cross Street property, planned to appeal, Crossbar attorney Joseph R. Woolman III said he had no comment. Ward likes to say that “a liquor license is a privilege, not a right” for big cases and small. Today he said it for perhaps his biggest case since becoming chairman in June. The Crossbar case had become a flashpoint for the mega-bar issue, with some saying large establishments serving alcohol are getting out of control, especially near Cross Street market, the site of the proposed beer garden. Supporters argued that the Crossbar would have been a unique addition to an area that is already known as a bar district. Woolman today had asked the board to dismiss the case. He cited case law and said his clients had not been properly informed that the lawsuit challenging the licensing validity, filed by a group of Federal Hill residents, was being remanded by the Circuit Court back to the Liquor Board. Woolman noted that his clients “played by the rules,” paid their renewal fees and were put in an impossible position by a strict interpretation of the 180-day rule given the delays and difficulty of getting projects done in Baltimore. “How, with this, could redevelopment happen in certain parts of the city?” he asked. Commissioner Jones, who voted against declaring the license dead, seemed to sympathize with those arguments. Jones asked the residents’ attorney, Patrick McNichol, to “help me to understand why” they should deny the license to someone who has already made an investment in his business based on encouragement from the past board. 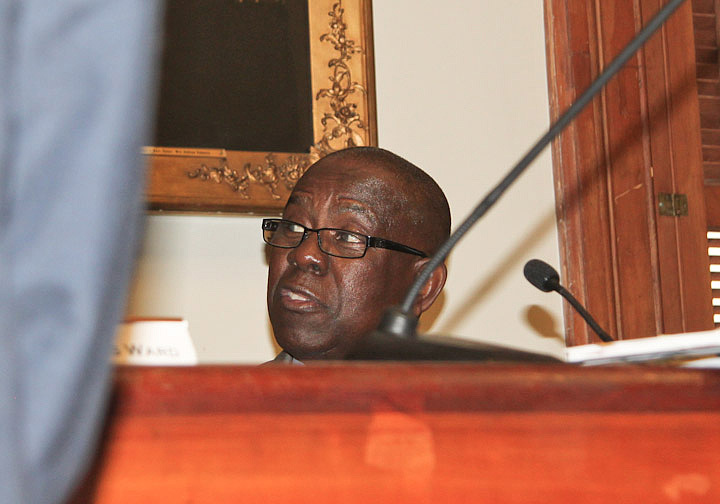 Former state Senator George Della, who testified on behalf of the residents, had a more plainspoken answer for Jones’ question at another point int he hearing. He said a project of this magnitude probably had “big-shot lawyers” who knew or should have known the law, even if the previous board wasn’t obeying it. Della, who was the sponsor of the 2000 state law that created the 180-day rule, testified about the “legislative intent” behind it. 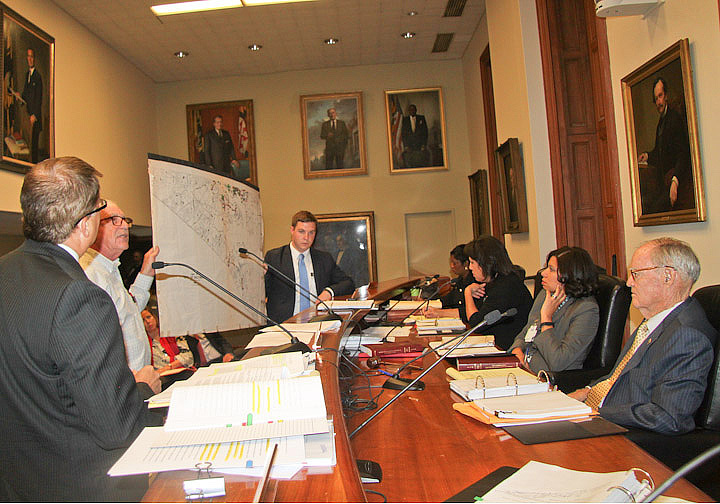 “It absolutely made sense because of the number of licenses that were around,” he said, showing the commissioners a large map of southeast Baltimore with bars and liquor stores marked. What happened after the 180 days? “The license is dead, that’s what the legislation intended,” he said. Commissioner Moore questioned Della closely and thanked him for his insights. Community Law Center lawyer and watchdog blogger Rebecca Lundberg Witt, who has been pointing out 180-day rule violations under the past and present board, said she was pleased by the decision and hoped the board would continue to enforce the law as it did today. But she was frustrated by the idea that Della’s insights might have broken new ground and helped the board turn a corner.